Third places – any place in our lives other than work or home where we spend time - have become a non-negotiable part of the workplace experience. They play a critical role in attracting and keeping the creative an innovative workforce we will need to compete in the very near future. Developing the third places in our community is not a matter of accident or serendipity, but a matter of intended social engineering designed to place our community in a position to attract exactly the workforce we require. This is a multi-faceted process, designed to enhance the lifestyle experience throughout the community, from dining, nightlife, music and performance to exercise opportunities, environmental commune and far more. Responsibility for the development of these third places is also a diverse picture. Municipal and regional authorities will be tasked to create the environment and infrastructure, private enterprise will, in many cases, provide the actual grass roots efforts. Past mores must be discarded, and the recognition of the fact that the creative class deals with a new set of priorities in making place decisions must be accepted. And chief among those priorities are the third place options a potential new environment can offer. Introduction – What is a Third Place, and Why is it Important? In a way, we’ve always had third places. Third places are simply places where we spend time when we are not at home and not working. Today, however, third places take on a much larger role in our lives and, subsequently, in defining our places. They are no longer only casual recreational spots or activities; they have become an incorporated part of our overall lifestyle. In that regard we need to recognize that, for some, especially those in the creative class, third places have actually become a non-negotiable asset. They define the concept of place every bit as much as the availability of meaningful employment and comfortable housing, if not more so. Third places are also somewhat unique in the concept of place development because they cross the generations a great deal more than other place characteristics. We see today that communities can be significantly impacted as population centers as much by senior centers and active retirement communities as they can by hike and bike trails and access to entertainment facilities. But what has really made third places significant in today’s world is the extent to which they have incorporated themselves into the everyday lifestyle of the creative class. A generation ago, an avid skier, for example, would relish a job opportunity which put them an hour or so away from the slopes. Today, an avid skier of the creative class doesn’t relish such an opportunity, they demand it. An opportunity without access to a ski resort nearby is, to them, no opportunity whatsoever. To that avid skier, their access to that third place directly impacts their ability to have an enjoyable and totally fulfilling life. Once you begin to understand these aspects of third places – that they have not only become engrained as part of our lifestyles, but have become significant aspects of living a fulfilled life, you begin to understand how important they have become in the establishment of the concept of place. A community that does not – or will not – recognize this does so at their own peril, because they are limiting the influx of talent that will drive their own economic prosperity. This sounds easy. All we need to do is give folks things to do in our community, right? Nothing could be further from the truth. At the same time, the truth is not that far away. Remember that place development involves planning a place that draws the kind of creative and innovative workforce that fills the community’s needs in becoming an economically prosperous community. To use a fishing analogy, if you want to catch bass, you may use a minnow; a bait shrimp will more likely get you a yellow catfish. Let’s look at some basic characteristic of third places. 1. Third Places represent a personal experience. The avid skier mentioned above has a best friend. That best friend is a rock musician. You might have the country’s best 5-star ski resort in your community, but if that is all you have, you are likely to not attract either of the above prospects. People have a variety of third place needs that must be fulfilled. More is better, and variety acts as a multiplier that enhances the community’s image as a desirable place. Third places are personal, but not necessarily on an individual basis. It’s the third place experience that is personalized, and that requires a variety of options. 2. Third Places fulfill an individual need. Sometimes that need is social interaction. Sometimes that need is creative. At other times, it may revolve around personal well-being. It may be a need to perform or just a need to unwind. More often than not, it fulfills a variety of the above, plus others. 3. Third Places take us away from home and work, yet they are as important as either of those for defining who we are and what we do. 4. Third Places are personally functional to us. What does that mean? We need what our third place experiences give to us. If we enjoy the freedom of bicycling and hiking, it is likely that the fitness benefits we enjoy as a result are very important to us. If we enjoy playing in a blues band, the creative performance outlet is something we personally need. Remember, we said that the role of third places in defining the desirability of place has become nonnegotiable? This is why. 5. Third Places are there when we need them. A simple statement with huge implications. As schedules become less important – and constraining – “on demand” third place experiences become proportionally more important. When you look at these five characteristics of third places in the light of the fishing analogy, it becomes apparent that the active design of third places is an important aspect of social engineering when it comes to planning the community we want to develop. In many ways, as we look at our community and plan the third places we want to develop, we are choosing the “bait” we will cast to “catch” the talented and creative workforce seek. The first thought that comes to mind when considering third places is, of course, entertainment opportunities, and for good reasons. For the creative class, entertainment options define so many characteristics of place, from the authenticity of the community to diversity to the ideal of acceptance. As pointed out by Richard Florida in Rise of the Creative Class, every single market that has developed a successful sense of place has a well established and unique music scene. If he is right, this has to be a priority for community planners in looking at the development of third places in our market. Community planners looking develop music in our community? Really? is provided. It needs to happen on its own to remain authentic. Once again, the key to this development is providing the environment. Downtown revitalization can be important in this, but it doesn’t have to end there. Throughout Killeen we have seen coffee houses and other business develop that encourage performances by local talent. the third place experiences that are available. 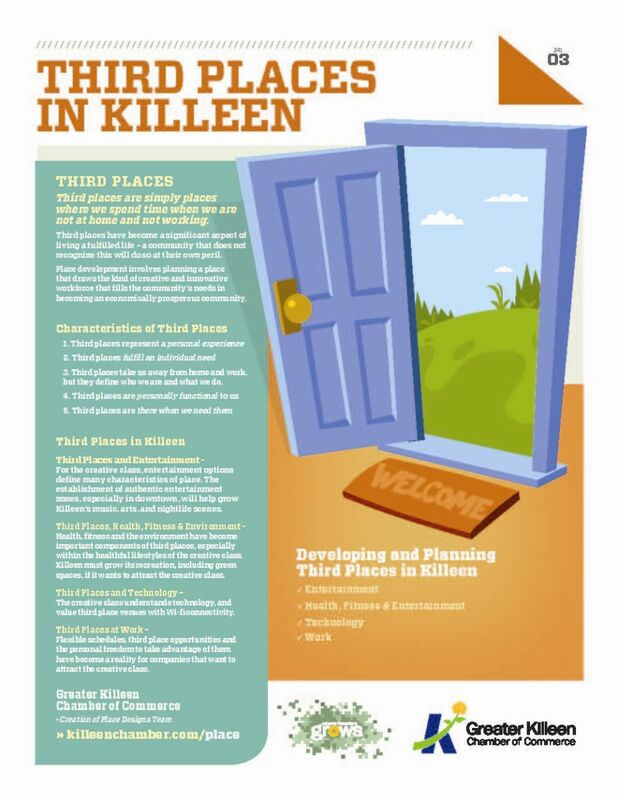 The arts play such an important part in providing a nucleus for development of third place opportunities, and the Killeen market certainly needs to expand its potential in this area. Existing groups and organizations provide only the most rudimentary framework for the arts in the market. Killeen Civic Arts Guild, Vive Les Arts, the Central Texas Community Band, MECA and other associated organizations are among the groups that provide consistent art outlets for third place experiences, but all lack the depth of experience needed to allow the market to stand above others in offering those third place experiences necessary to draw significant talent to the market. Expansion of the arts in Killeen is simply a must to provide these experiences. Past experiences indicate that the establishment of a local symphonic orchestra is important to talent and companies alike. So is the development of a local art museum. Dinner theater opportunities have never been prevalent in the market, yet are among the most popular third place experiences across the nation. Local arts festivals, while in planning, need to be established that will be representative of our market. The development of the arts experience in Killeen should not lose sight of the nature of the market; a market that consists of a highly ethnic population and a population that is much younger than is found in other markets. Arts experiences designed in a traditional way that would succeed in a market such as Temple are likely to be far less successful in Killeen as a result. Local educational entities, from KISD all the way to CTC and TAMU-CT, must play a major role in this development. Fort Hood must be included as a source for talent and also a source for ideas of what the market needs. Without a doubt, especially when dealing with members of the creative class, night life is probably the single most important aspect in developing third place experience in our market. This conclusion is supported by information derived by the Veteran’s Inventory as well as Rebecca Ryan’s “Handprinting” analysis. In a way, the development of a healthy night life in the market brings together so many of the aspects already mentioned. Expanded dining experience – especially those not incorporated in the national chains – starts this experience. Once again, we will see that Authenticity is important. Music and performance add to the night life third place opportunities. The club scene in Killeen needs to also mature. With Fort Hood nearby, clubs and night spots in Killeen have evolved in much the same way as the fabled pawn shops and used car lots which have given the market its too-often-applied “scruffy” label. It was far too easy to establish no-class night spots that operated on a shoestring and provided high profits for the owners. They, however, did nothing to enhance the market and provide a meaningful third place experience. facilities such as these will be able to change past trends, but committed management that have been successful in this type of operation in the past are optimistic. Once again, the establishment of a well-controlled and higher class entertainment district in downtown Killeen can also be a catalyst in this effort. This entertainment district can provide the environment that allows innovative entrepreneurs to be successful and add to the community’s high quality third place experiences. Health, fitness and the environment have become important components of third places, especially within the healthful lifestyles of the creative class. “Working out,” regardless of the venue, has become as much of a social experience as an exercise experience. It is the “new wave” in third place experiences. A large part of making exercise opportunities a third place option revolves around the public venues available for free and unrestricted use by the residents of the community. Talent prospects to our community care, like never before, about the public recreation facilities available to them. And it’s important that we, while planning those facilities, don’t think to much “in the box.” Public park land, is, of course, important, but so are other public facilities, such as public tennis courts, swimming pools, skateboard parks, racquetball courts and a host of other public facilities that need to be available for health and fitness third place options. Other communities our size and smaller offer these amenities, and are actively using them to compete with us for talent. Most importantly, they make a difference. Just as important, as Rebecca Ryan pointed out to us, is how we market these facilities. Everyone who reads the Killeen Daily Herald probably knows we have a new Hike & Bike trail. But what about the new talent prospect for our area who just graduated from Texas Tech, and looks to the internet to find out what we have to offer. While certainly a problem not confined to health and fitness third places in our market, this illustration certainly provides graphic proof of where we need to do a better job of marketing the Killeen product. In addition to public health and fitness related venues, private facilities available to the creative class are also very important. From a social interaction point of view, it may well be within bounds to say that private workout facilities have becomes the “new malls” of the creative class. People of the creative class use private workout facilities not only for exercise, but as a third place experience to meet new friends, exchange ideas, develop business contacts and as an overall social experience. It’s important to realize this, because it allows private exercise facilities to fit in well with dining, theater and nightclub facilities as part of an overall third place experience. Finally, with the environmental awareness of the creative class, it is important to realize that green and blue spaces are vitally important to their third place experiences. As corny as it may sound, “to be one with nature” is generally a huge driving influence for members of the creative class, and, once again, they demand that natural commune, not just request it. Our area really has historically done a very good job in that area. What we haven’t done is market that part of the Killeen-area experience well. A story in Texas Parks is no longer enough. Our area outdoor facilities must become internet friendly. We must bring the richness of our outdoor experiences – our outdoor third places – alive in their internet presence. Only when we can allow talent prospects to vicariously experience the natural beauty of Central Texas can we expect them to look toward us and our natural assets as a meaningful third place option. are not an exception. The obvious reference, of course, is making most any third place technology friendly. Wi-fi hot spots need to become common at venues from the traditional coffee shops to the not-so-traditional fine dining restaurant. Go to Austin for lunch and observe the number of laptops you will see operating at the tables of the Driscoll restaurant. From a business standpoint, this makes perfect sense. “Connecting” a third place venue not only makes sense for the customer and their lifestyle, it gives them a reason to spend more time – and money – at the venue. There is more to using technology in third places, however. Using broadcast text messages or e-mail to advertise and promote upcoming third place events is just starting to catch on. Not only is this method targeted to customers, it’s timely, accepted and far less expensive than traditional advertising media which has lost a lot of its luster to members of the creative class. Reserving table space or even placing a dining order in advance over a smart phone internet connection is not only appreciated by the creative class, it’s becoming expected. Businesses today in some traditionally high-tech markets (like Austin) are even making reservation, ordering, even social networking “hook-ups” available through “Second Life” - type experiences over the net. Technology in the realm of third places has actually worked to change the model in which our communities operate. A decade ago, “wiring” an entire community through the municipal entity was seen as the obvious solution, and many communities accepted that model. Today, with the evolution of technology, we have discovered this is just one core aspect of life that can best be handled privately through private networks and growth of internet hot spots by individual businesses. Forget it! I’m not about to open up a video gaming room at my business! Certainly your choice. Just remember that you may be losing that perfect prospect to a business – either here or elsewhere - that does. The creative class grasps a new work ethic. Their sheer productivity suggests this is not bad, and certainly doesn’t begin to suggest they don’t get the job done. On the contrary, it actually suggests that the creative class works very well independently, and members of the class know when they need to take advantage of a third place experience to refresh and enhance their capabilities. A decade ago, it would be unheard of to imagine your best employee simply walking out at 10:30 a.m., putting on his helmet and spending the next half-hour on a bicycle ride. Today, that employee may well do exactly that, come back to the office and put the finishing touches on a product presentation that lands a $10 million advertising account. We all reach limits, and always have. What has begun to happen in our workplaces is the recognition that we all know those limits, know how to refresh ourselves with a third place experience, and have the work ethic to then come back to the job and complete it. And that is what “Just in time” third place experiences are all about. Google has certainly proven the concept of extending this idea to the workplace in spades. They have no offices, no set schedules, a number of 5-star restaurants on the campus, several fitness clubs, temporary apartments where employees can stay while working on projects and a number of other third place opportunities on site. Employees bring pets to work. They have roughly 3,000 openings per year, for which they get almost a million applications. As a result, they get – and keep – the best and the brightest. And their bottom line – and its growth - reflects the results. Certainly, no Killeen-area business could go to the extent to which Google has. But just as certainly, they should become open to the concept. Flexible schedules, third place opportunities and the personal freedom to take advantage of them have become reality’s in any part of the workforce that wants to attract the creative class. That is a concept that is proven time and time again across the nation, even if at a much reduced level than Google. By extension, this is also a positive for those businesses that provide third place experiences. A coffee house with a hot spot is no longer limited to serving its customers from 8 – 10 a.m. A lunch spot with live entertainment may now find its lunch crowd runs until well after 4 p.m. The third place experience can be necessary any time. “Just in time” to refresh, invigorate and recharge today’s creative class.